21st, 22nd June 2016 Current Affairs MCQs, Quiz, Questions: Current Affairs for June 2016, Daily Multiple Choice Questions (MCQs) for India GK, World GK and current affairs with Collection of daily objective type Question by www.Indiagk.net based on General Knowledge (GK) and General Science (GS) Questions for UPSC, State PSC, SSC, Police exam, Railway exam, SBI, Bank PO, IBPC, SSC, LDC, UDC, Army, Airforce, Navy, Coast Guard, Bank Clerk, TET and all entrance examination with current affairs News, Multiple Choice Questions (MCQs) available on Website www.IndiaGK.net and Android Apps with daily updates:. Which state team has won the first edition of India’s Bad Bull Softball League? Explanation: Maharashtra have won the first edition of India’s Bad Bull Softball League by defeating Punjab 2-1 at Saket Sports Complex. The league was recognised by the Delhi Softball Association (DSA). The Softball league was an effort to encourage amateur baseball and softball at entry level among the common masses. Check Detail EXPLANATION at INDIA GK Mobile App. What is the theme of the 2nd edition the International Day of Yoga (IDY) 2016? Explanation: International Day of Yoga (IDY) is observed on June 21 every year to spread awareness about yoga. Yoga is an invaluable gift of India’s ancient tradition. This tradition is 5000 years old. Check Detail EXPLANATION at INDIA GK Mobile App. Who inaugurated 2-day international conference on Yoga on 22nd June 2016? Explanation: A two-day international Yoga Conference titled "Yoga for body and beyond" organized by Ministry of AYUSH was inaugurated by Vice-President Hamid Ansari on 22nd june 2016 in which delegates from 32 countries take part. About 70 international delegates from countries. Check Detail EXPLANATION at INDIA GK Mobile App. ISRO on 22nd June successfully launches how many record satellites ? Explanation: Indian Space Research Organisation (ISRO) on 22nd June 2016 successfully launched a record 20 satellites from its Satish Dhawan Space Centre in Andhra Pradesh's Sriharikota. The 320 tonne PSLV C-34 was carrying 17 foreign small satellites from Canada, Indonesia, Germany and the US but the main passenger was a 727 kg Indian earth observation satellite called Cartosat, which can take images at sub-meter resolution. 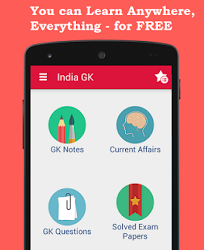 Check Detail EXPLANATION at INDIA GK Mobile App.